10. Watching Animals from Our Room at Animal Kingdom Lodge - It was definitely worth the money to stay at Animal Kingdom Lodge with Brody. 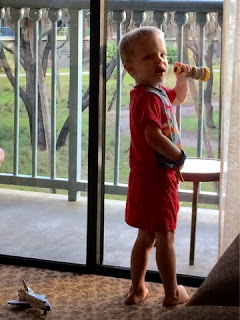 He loved waking up and returning to his room each afternoon and evening to look for animals. The Sunset Savannah is the best for animal viewing at Kidani Village if you are planning to stay here on your next trip. I spy zebras, giraffes, and okapi - oh my! 9. Disney Jr. Live On Stage - The "big four" from Disney Junior appear on stage as puppets in one magical story - Mickey Mouse Clubhouse, Doc McStuffins, Sofia the First, and Jake and the Neverland Pirates. This is totally designed for preschoolers in mind. 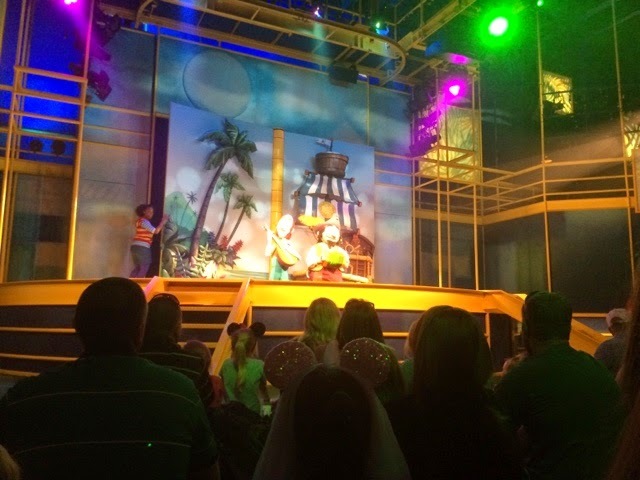 Everyone sits on the floor and the expectation is for kids to dance, sing, and play as the show takes place at Hollywood Studios. 8. 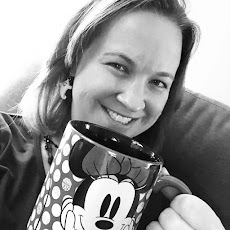 Toy Story Mania - Another Hollywood Studios attraction! 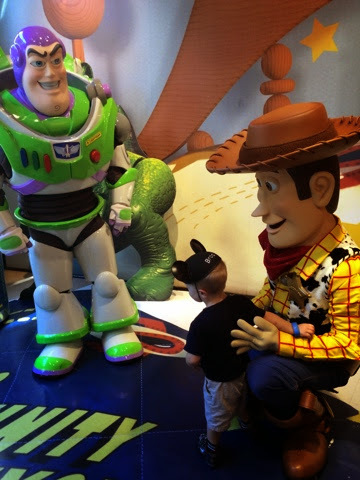 Brody was too little to wear the 3D glasses and to really play the midway games effectively, but that didn't stop him from loving the surroundings of Andy's Room and interacting with his favorite Toy Story characters during the ride. Long lines are the norm here, so be sure to secure a ride with your FP+. 7. Prince Charming Regal Carousel - This one surprised me. We've been to other places with carousels and Brody really wasn't interested. But every time we passed by the carousel at Magic Kingdom, we had to pause to "ride the horses." Another great feature of this ride - a lot people can ride each time which means that even when the line looks long, it moves quick. 6. 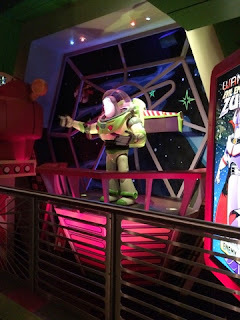 Buzz Lightyear's Space Ranger Spin - Another Magic Kingdom ride. Brody loves Buzz Lightyear and we were able to ride this multiple times since it's not as long of a wait as Toy Story Mania. Brody tried his best to get Zurg, but was still a little small to fully participate in the ride. He had a great time though and would ask to go back. 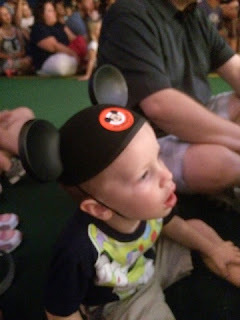 Stay tuned in a few days for the Top Five from Brody's experience!